Attached to our standard keyboard platform, which is designed to support nearly all standard keyboards, the swivel mouse provides a wide range of adjustability within the Neutral Reach Zone. 8 or 10-inch platforms are available in left, right and dual positions. 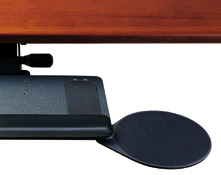 Question: How does this mouse platform attach to the keyboard tray? Answer: For swivel model, you would need to drill a hole for the installation. Question: Does this mouse platform come with screws and so forth for attachment? Answer: This unit does not come with screws for attachment. Any standard screw and bolt will work and can be easily purchased at any hardware store.